A cool and cloudy morning over the Forest of Bowland, the moorland heart of Lancashire. As we walked the sheep pastures under the dun brown shoulder of Beatrix Fell, a curlew got up from its nest among the sedges and flew low past us. Its long downcurved bill quivered open to emit the familiar bubbling trill that haunts these northern hills. The sedgy field path brought us past a string of old stone farmhouses, then up the open flank of Dunsop Fell and out into open moorland. 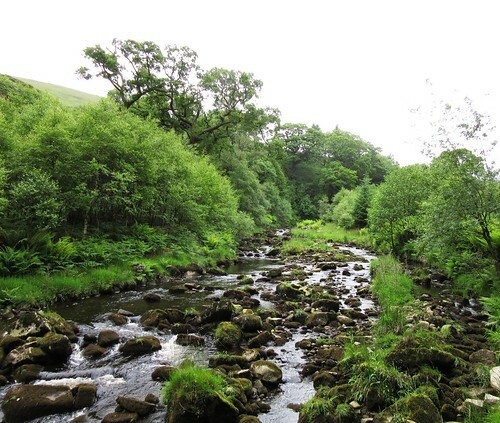 In past times the Forest of Bowland lay under harsh laws of prohibition. The landlord’s tenants were made to pass their dogs through a silver hoop – any animal too big and powerful to scramble through would be destroyed as a potential poaching asset. Grouse shooting interests were paramount, and ramblers were strenuously discouraged. But times and tempers changed. 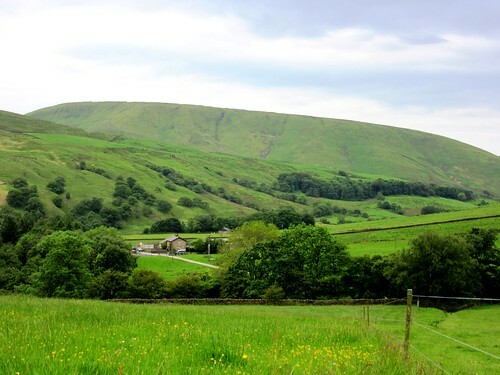 When the Countryside and Rights of Way Act was passed in 2000, this enormous wheel of bleak and beautiful country was opened to all walkers for the first time in history. 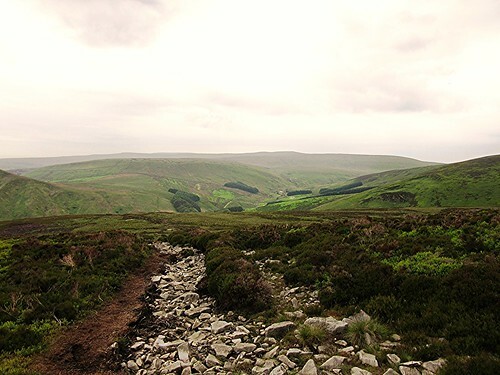 Bowland is properly wild country, with plenty of surprises for walkers. 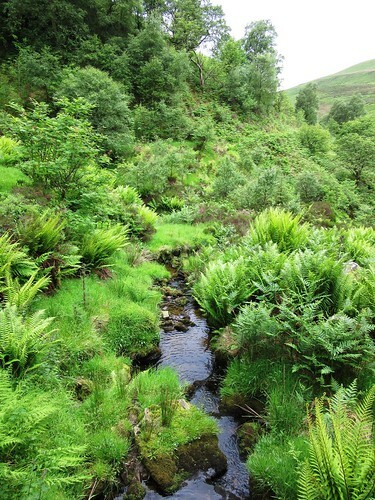 Up at Dunsop Head we found the springs of Dunsop Brook overflowing with stored rainwater. We floundered along through soft, sloppy, sucking peat and moss. Jane went in knee-deep, emerging with a tremendous sucking sound as though the bog were smacking its lips over her like a tasty lollipop. Down in the hidden cleft of Whitendale, other ornithological celebrities are resident – a pair of breeding eagle owls, surprise incomers with six-foot wingspans, capable of taking out a young deer. We didn’t spot these beautiful strangers on the way back to Dunsop Bridge. But there were grey wagtails and herons, white-chested dippers and black-capped stonechats, and a crowd of jolly house martins hawking over the river, their white rumps and scarlet streaks a vivid splash of colour against the grey skies of evening. Road: M6, Jct 31a; B6243 (‘Clitheroe’) through Longridge; 1 mile past Knowle Green, left on minor road through Whitewell to Dunsop Bridge. Walk (10½ miles, strenuous, OS Explorer OL41. NB: Detailed directions – highly recommended – online map, more walks at christophersomerville.co.uk): Right along road; just before bridge, right (‘bridleway’) along drive. Pass terraced houses (658507); in 100m, right (yellow arrow/YA) through kissing gate, up steps, over stile; ahead along fence. At ruined wall, half-left to Beatrix Farm (664514). 100m past farmhouse, left through gate. Blue arrow/BA points ahead, but follow 2 YAs (pointing left) along right bank of stream (YAs). In ½ mile, at bottom of Oxenhurst Clough, cross stream (671518). Follow YAs, with fence on right, to farm drive (674521); on past The Hey to Burn House (682528). Through driveway gate and on down to lane (685522). Left for ¾ mile. Left up drive (694530, ‘Burnside Cottage’). Skirt Burnside Cottage through gates (690537); on up fellside beside stone wall (BAs). At top of wall (687540), through gate; bear right. 200m past conifer clump, path hairpins back left and climbs for 1 mile to Dunsop Head (676542). NB! Deep, wet bogs across the path here! Bear left to stone wall on high ground to left of bogs; follow it to the right, to a fence curving away to left; follow this fence west, then north, keeping close to it, and treading with care, till you meet the wall again near a gate (675544). 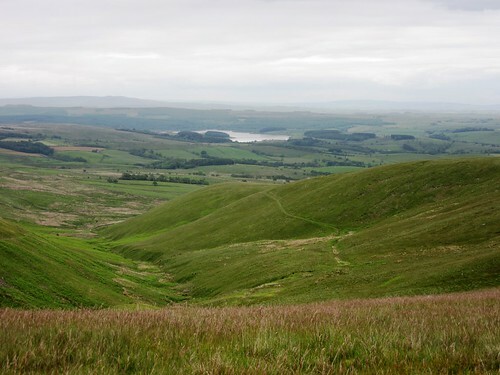 From the gate, left along moor path (yellow-topped posts, arrows, cairns) for 1 mile, descending to Whitendale. By first stone wall of farmyard, left (662550, unmarked) on path with wall on right. 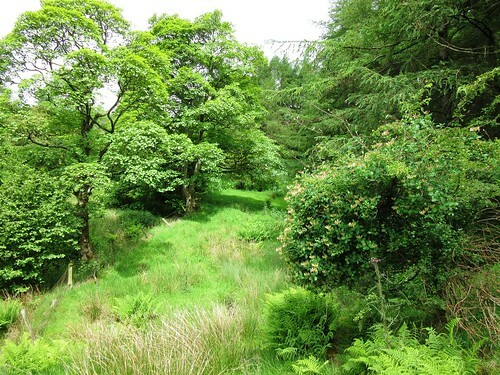 In nearly 1 mile, horseshoe left across Costy Clough footbridge (659536). 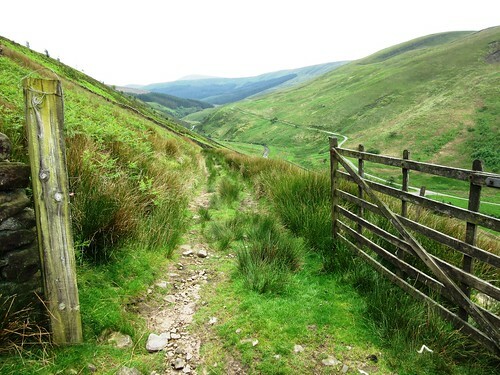 In 150m, right over stile, down to track; left for 500m; right across footbridge (654533), left along road for 2¼ miles to Dunsop Bridge. 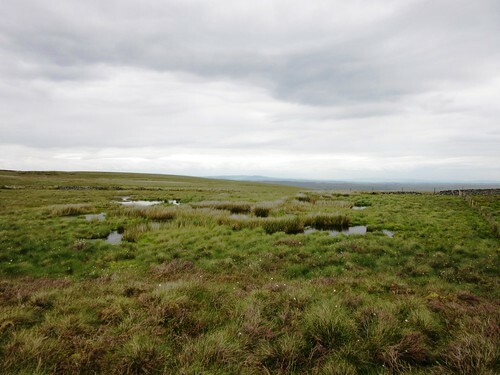 Conditions: Deep, wet bogs at Dunsop Head. Hill-walking gear, boots, stick.